As you make your way on Boston’s Freedom Trail you will go pass Faneuil Hall and the Quincy Market. 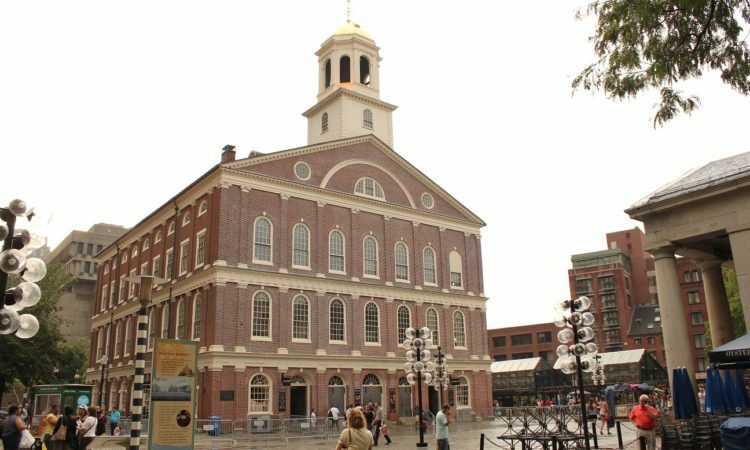 You can get more information on Faneuil Hall and the Freedom trail at the visitor center for the Boston National Historical Park in their downtown visitor center on State Street. Faneuil Hall Marketplace is both the best and worst of a travel destination. The historic significance of the building and its place in history cannot be denied. It still brings a wealth of emotions when you contemplate what transpired here. Rita became a naturalized US citizen in the hall and it brings special memories for her. On the other hand the commercialism of the area is the very definition of “tourist trap.” The food stalls in Quincy Market are what you will find in any major mall food court in the US and the clash of crowds can be overwhelming. It is however the largest food hall in New England with over 35 international food vendors inside the Quincy Market Colonnade. My suggestion is that you go up to the second floor of Faneuil Hall and see the meeting room and then instead of stopping at the food stalls go to one of the literally hundreds of restaurants that are only blocks away for lunch. Grab a cannoli at Mikes or Modern in the North End or sit down in one of the many restaurants.